Knowing your asset allocation is an important step to control and manage your investments. In a perfect world, you should be able to easily calculate and see your asset allocation. Simply press the button and voila! The reality is not that simple. Not all accounts you may have easily work together and that usually leaves you in charge of figuring out your asset allocation across all your accounts. Sounds simple? It can be but it can also require some work. If your finances have evolved to multiple accounts with different investments, it’s probably not that simple. Accounting software can greatly ease the pain of consolidating your statements but not all of them are online. For starter, not all investment providers allow you download statements not to mention that not all investments are publicly tracked openly. For examples, my company RRSP plan has mutual funds that aren’t trackable trough public markets. They are proprietary to the company and often times catered for the company they provide the service for. With that said, the solution for me is manual tracking with Google Spreadsheet. A spreadsheet is perfect for the job as you can leverage its graphing capabilities and the math functions to group your investments under the appropriate allocation. You just need to build a table to categorize and track the information you need for the asset allocation graphs you want. I’ll warn you up front that mutual funds are not easy to track within many other accounts. 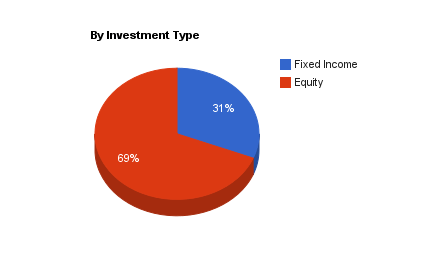 The fund company’s report will easily report your allocation for what you hold with them but you may have to do a bit of work to fit it within the different asset allocation graphs you desire. As mutual funds hold many other investments such as cash, bonds or equities, you may have to either classify the mutual fund as one asset or group the holdings within the fund. There is more than one way to look at your allocation. Some may be more important than others depending on your investments but it’s nice to see your portfolio from different angles. If you use a spreadsheet, it’s pretty easy to classify your allocation differently as shown below. 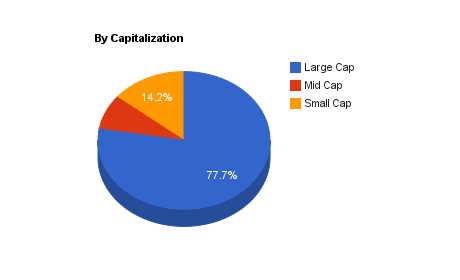 Just as an example, I am showing my dividends investment allocation below. The first graph represents my overall portfolio allocation otherwise it represents the dividend producer of my portfolio. To my surprise, I thought my fixed income ratio would have been higher. I put it together just recently and while I thought it was too high, seeing it this way changes my perception. If I look at my company RRSP account, it’s almost 60% but when I look at it across my entire portfolio, 31% isn’t too high. 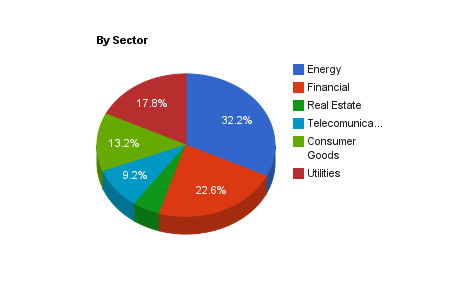 The asset allocation by sector allows you to see if you are more exposed to cyclical or risky companies. For example, I am overweight in the energy sector and it’s compounded by the fact that my holdings are only in one company. I have a plan to reduce my exposure here, I just have not pulled the trigger yet. 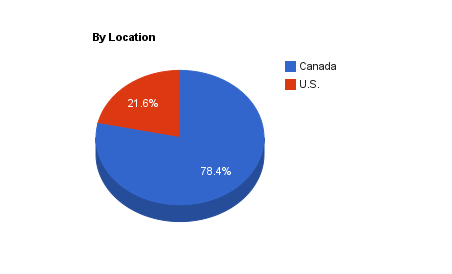 As the saying goes, Canada represents only a small fraction of the economic pie of the world. To benefit from the world economies, it’s often recommended to hold international investments. Personally, I understand Canada and the U.S. and that’s enough for me. I prefer to invest in a North American conglomerate that does business all over the world to get more international exposure. In any case, a graph by allocation can tell you if you are increasing your risk and may indicate that it is time to rebalance. Feel free to set your own guidelines. My primary focus in reviewing my asset allocation is to identify potential risks and future rebalancing. I would recommend you review your allocation at least once per year, and if possible, twice. One of the benefits of rebalancing based on percentage is that it indicates when one allocation does better than the other and it forces you to take your profits and redirect them towards your less performing investments.